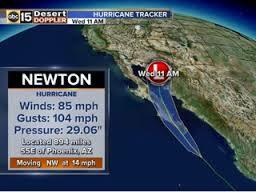 On Deck With SV Liahona: Hurricane Newton...dangers on dry dock. 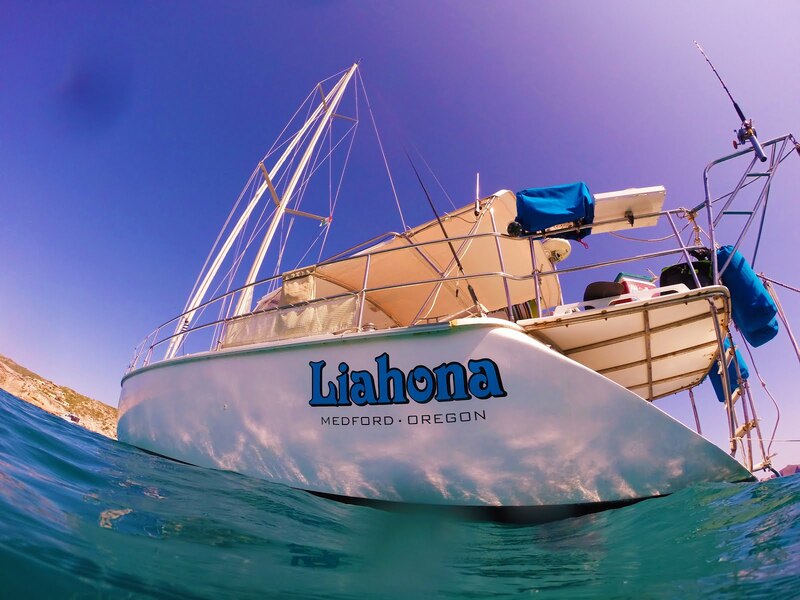 For the last 3 yearss we have chosen to end our cruising season in the Sea of Cortez and put our boat up on the hard in Marina Seca San Carlos which is about two thirds the way up the sea on the mainland side of Mexico in the state of Sonora. 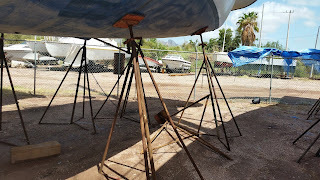 Hauling out is costly and is definitely a lot of work but we have chosen to do so mostly for the safety factor of being out of the water during hurricane season in the eastern Pacific thinking it is the safest place to be if a hurricane passed through. While I still believe it safer on the hard than in the water, it is not foolproof nor does it come without risks. 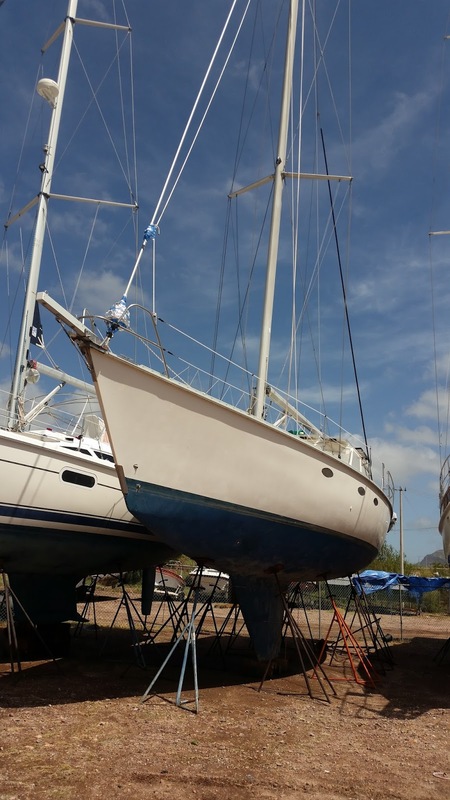 In the 3 summers that the boat has been dry docked in San Carlos we have seen two hurricanes that have threatened damage to her. 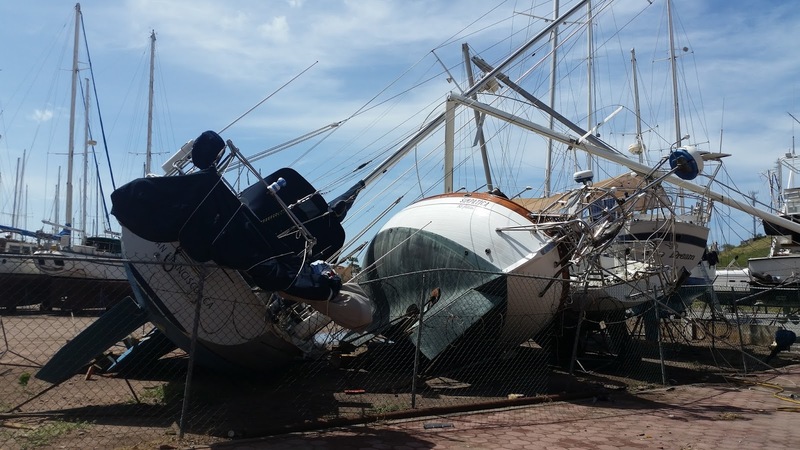 In September 2014 hurricane Odile packed some serious power and wreaked havoc along the Baja peninsula before passing by San Carlos. 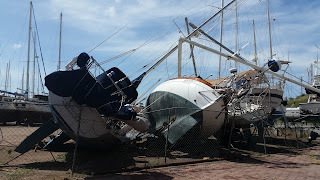 However, we had no damage to the boat and I was told that there was no damage to any of the 400-500 boats that were dry docked in San Carlos. In the water there were several boats in the marina that sustained minor damage and about 5 boats in the anchorage that went aground. 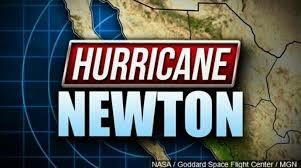 This year we had a close brush with hurricane Newton which finished up it's run in the Sea of Cortez by passing just to the northwest of San Carlos and neighboring Guaymas leaving the two ports in the northeast portion of the hurricane...the most powerful and dangerous quadrant of a hurricane in the northern hemisphere. This time the boating community was not so lucky. 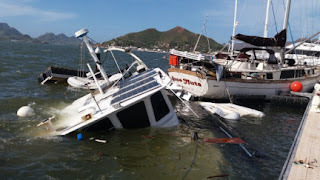 In Guaymas the docks came apart in the marina and it was reported that 5 boats sank, a local fishing boat also went down with 5 onboard where 2 of the crew were found dead and 3 others still missing but presumed dead as well. In San Carlos the marina fared very well with only minor damages reported like scrapes and scratches from boats whose lines loosened during the storm. Marina Fonatur, Guaymas, Sonora Mexico. More loss from the breakup of the docks in Guaymas. On dry dock, where we presume it to be safe, was another story. 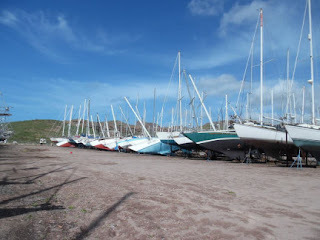 25-30 boats were toppled during the night, most of which were part of a domino line in the middle of the dry storage area. From the reports some of the damage was minor from tipping over but many boats suffered much more like broken masts, crushed hulls, etc. 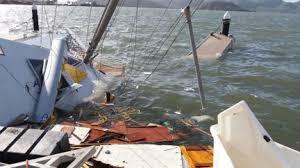 from hitting the ground and other boats next to them. We were relieved to find out that we were not part of that "domino line" and all is well. However, after this experience it has pressed us out of a complacent mindset and forced us to think through our placement in dry dock next season. Chief among the problems in dry dock that cause boats to topple are canvas left on boats and erosion under the stands, especially if you are on dirt. 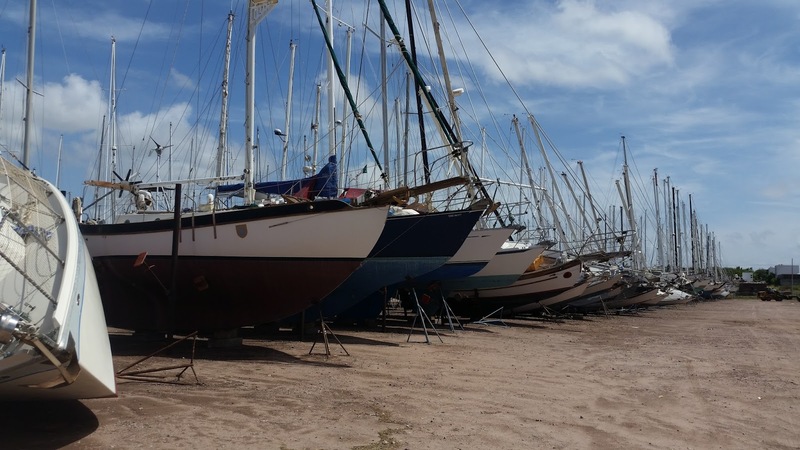 The majority of boats in dry dock are well prepared for a blow. 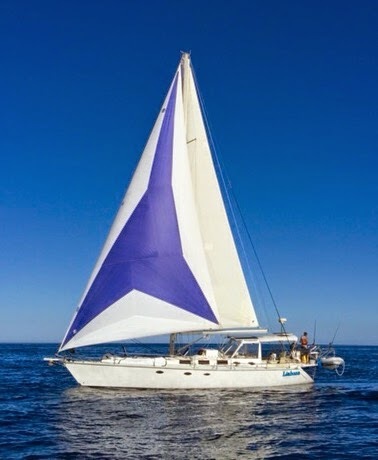 However, I still see many with genoas left on furlers and mainsails left on the boom with only a loose sail cover to protect them from the sun. 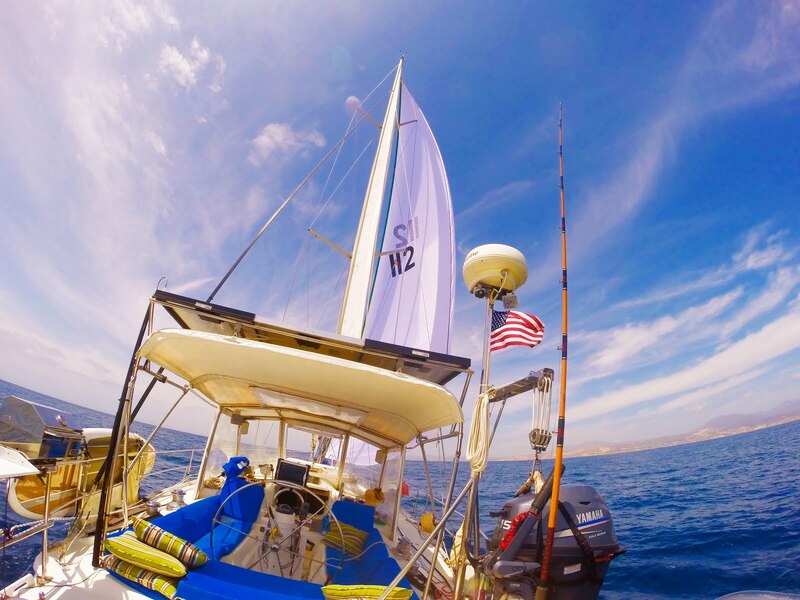 Why are boats even allowed to have a headsail left on a furler? 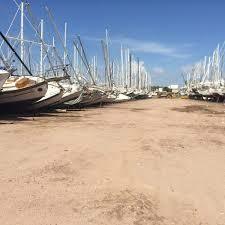 For the safety of all of the boats it should be a requirement that NO canvas be left on the vessel. You can prepare all you like but if there is someone next to you is too lazy to pull his headsail and it comes undone during a storm, that boat WILL go down. If you are his neighbor, you are going down with him. By the looks of the pictures of the damage in "domino row" it appears that is exactly what happened causing 20 some odd boats in that row to go down due to one who was not properly prepared near the front of the line. Not the row to be in after the storm. Erosion of the earth below the stands is another real problem if you are sitting on dirt. 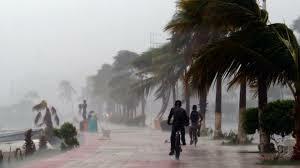 There is not much you can do about that other than insist on being on concrete but that may not be an option and even if it is there is still the possibility of storm flooding, debris flowing in the torrents and the consequent erosion that comes with it. 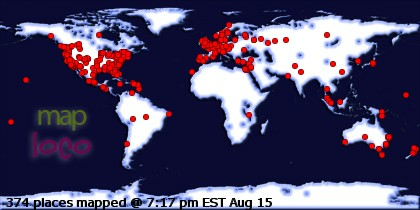 Under SV Liahona, one stand down...yes, we are lucky the rest held. Liahona still standing after the storm. After this year we will take a more active approach to where exactly we sit in dry dock an try to secure the boat away from possible dangers. It will never be perfect but we can definitely prepare and protect better. We are grateful to get through this without damage and our hearts go out to those who were not so lucky. Live and learn. Thank you so much for you kind words Bukan. I appreciate hearing things like that and we are happy that we can share. Be peace. Update...Video of the new galley table build.